Enlarge Image Composite images of the airflows and corresponding fluxes of acrolein into tissues lining the respiratory airways of a human and rat following atmospheric exposures. 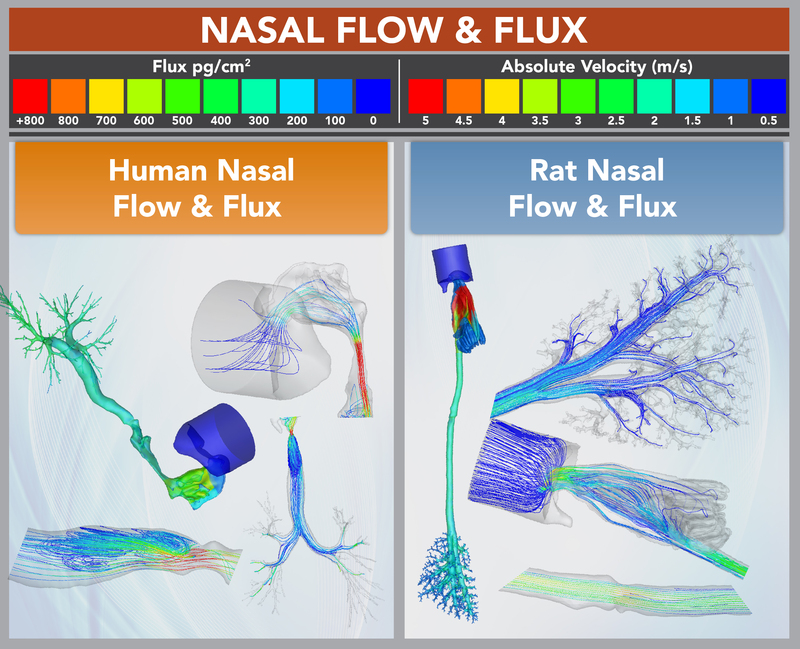 The images were created using 3D computational fluid dynamic and physiologically based pharmacokinetic models for the respiratory system developed at Pacific Northwest National Laboratory. Congratulations to a team of Pacific Northwest National Laboratory toxicologists and their colleagues whose journal article was selected as the 2012 best paper by the Biological Modeling Specialty Section of the Society of Toxicology (SOT). "Comparative Computational Modeling of Airflows and Vapor Dosimetry in the Respiratory Tracts of Rat, Monkey, and Human" was selected from more than 1,000 publications. The paper, which appeared in the May 12 issue of Toxicological Sciences, describes the development of the first-ever computational fluid dynamic (CFD) models for upper and lower respiratory airways of a rat, a monkey, and a human. These models are anatomically correct, and they take advantage of advancements in high-resolution magnetic resonance and X-ray computed tomography imaging and computation. Before this study, most CFD models of the respiratory system were limited to discrete regions such as the nose, larynx, or tracheobronchial region. The models will help assess the potential risks for exposure to highly reactive water-soluble gases and vapors such as formaldehyde, hydrogen sulfide, and acrolein. The authors are Richard Corley, Dan Einstein, Senthil Kabilan, Andrew Kuprat, James Carson, Kevin Minard, Rick Jacob, and Chuck Timchalk, PNNL: Robb Glenny, Sudhaker Pipavath, Timothy Cox, University of Washington; Christopher Wallis, Richard F. Larson, Michelle Fanucchi, University of California, Davis; and Edward M Postlethwait, University of Alabama, Birmingham. The team will be recognized at the SOT Annual Meeting March 10-14 in San Antonio, TX. SOT is a scientific organization for professionals involved in toxicology, the study of the adverse effects of chemical, physical, or biological agents on living organisms and the ecosystem, including the prevention and amelioration of such adverse effects. It has more than 7,000 members worldwide. The work was supported by grants from the National Heart, Lung, and Blood Institute and the National Institute of Environmental Health Sciences of the National Institutes of Health. Reference: Corley RA, S Kabilan, AP Kuprat, JP Carson, KR Minard, RE Jacob, C Timchalk, RW Glenny, S Pipavath, TC Cox, C Wallis, R Larson, M Fanucchi, E Postlewait, and DR Einstein. 2012. "Comparative Computational Modeling of Airflows and Vapor Dosimety in the Respiratory Tracts of Rat, Monkey, and Human." Toxicological Sciences 128(2):500-516. DOI: 10.1093/toxsci/kfs168.